We all know that deer carry the ticks that spread Lyme Disease, but mice are carriers, too. Used properly, tick tubes are said to reduce the risk of exposure to an infected tick by up to 97 percent. Basically, your tick tubes are going to provide treated nest-building materials for mice so that the ticks they carry will be killed, while the mice and other animals on your property aren’t harmed. You can buy pre-made tick tubes, but that gets expensive, and many use highly toxic pesticides. Picaridin, produced synthetically in the lab, is a less harmful chemical derived from the plant that produces the pepper in the shaker on your table. According to the Environmental Working Group (EWG), Picaridin does not carry the same neurotoxicity concerns as DEET, and Permethrin (frequently recommended for DIY tick tubes) is toxic to cats and fish. Overall, EWG’s assessment is that Picaridin is a good DEET alternative. Take cotton balls or dryer lint, soak or spray them thoroughly with Picaridin, let them dry, and put them in the tubes. Place the filled tubes in areas that look like prime mouse habitat: near rocks and wood piles, in overgrown and wooded areas, around buildings, etc. Mice tend to be unseen, so focus on areas where you see chipmunks during the day. To have the desired effect, you will need to gather and re-fill your tubes, or distribute new ones, every few weeks from spring to late fall. 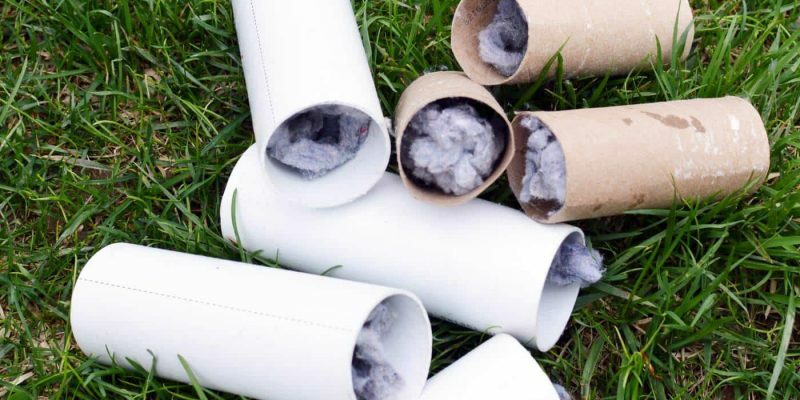 Though the cardboard holds up surprisingly well, you may also use lengths of PVC pipe, but paint them orange and map their placement so they can be easily found and not left as litter on the landscape. Some people recommend placing tubes every 10 feet; others every 10 yards. (It’s a young science!) Experiment, and see what works best for you. When you make your own tick tubes, you can afford to use them liberally.